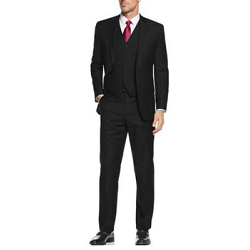 Salvatore Exte Men's 2 Button Vested Suit. JACKET: Two button single breasted modern fit jacket, dual side vents, notched lapel, full lining matching the color of the suit, 3 pockets - 2 with flaps. The suit comes with 4 button vented sleeves featuring working buttonholes that still allow the jacket sleeves to be shortened or lengthened for up to 2 inches. VEST: 5 button vest matching the color of the suit with 3 outside pockets. The vest features an adjustable belt at the back. PANTS: Flat front dress pants lined to just below the knee. Pant leg length unhemmed. These pants come with a standard 6" drop in the waist (e.g. a US 40R jacket will come with 34" waist pants). The waist can be altered in or out up to 2 inches. This suit is factory packed with a hanger and all tags are in place. Fine tropical weight man made fabric T/R - 65% Poly 35% Viscose. Imported China. Dry clean only.